Oregon court decision suggests Sheriff is wrongly detaining immigrants. Sheriff David Clarke speaking at the 2016 Conservative Political Action Conference (CPAC) in National Harbor, Maryland. Photo by Gage Skidmore. 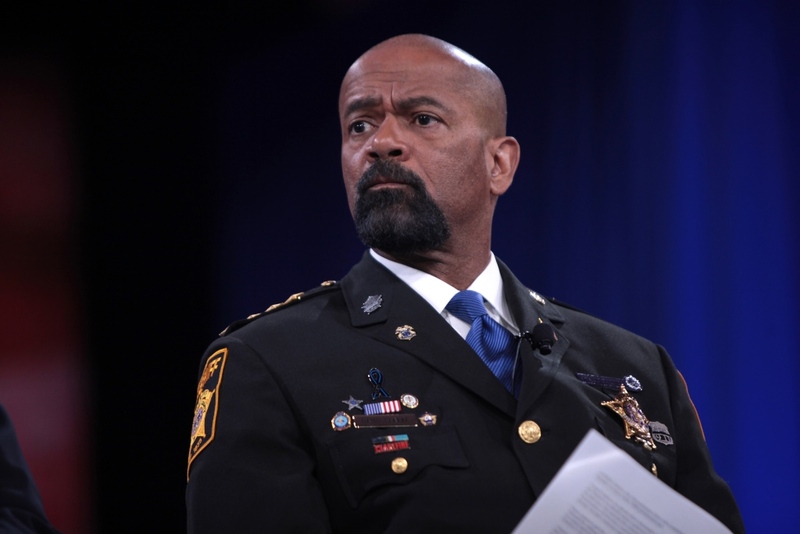 Milwaukee County could face liability on constitutional claims related to Sheriff David Clarke‘s participation in a federal program that places immigrants in detention. A federal judge in Oregon has ruled that a request from the federal Immigration and Customs Enforcement (ICE) does not constitute a reasonable cause to incarcerate a person. A detention without probable cause violates the Fourth Amendment to the Constitution, the judge ruled. While not binding on Wisconsin, the Oregon decision clearly lays out the danger in accommodating detention when there is little or no evidence of criminal activity. Clarke’s detention of immigrants has also created controversy because he has refused to publicly release records from the program. Voces de la Frontera, an immigrants rights group, had sought access to ICE forms called I-247s that ask local law enforcement to honor the extra-long detention for specified inmates ICE believes may be in the country illegally. Lower courts had decided in favor of the group, but the Wisconsin Supreme Court ruled, 4-2, last week in favor of Clarke’s contention that he can keep secret any records related to inmates who remain incarcerated beyond their normal release point at the request of ICE. The extra-long incarceration is limited to 48 hours, but Saturdays, Sundays, and holidays don’t count, according to the Oregon Federal Court decision in Miaria Miranda Olivares v Clackamas County. That means the actual extra incarceration could be much longer than 48 hours in many instances. Asked if the ruling meant the state now has a secret detention program, attorney Peter Earle responded, “I think so.” Earl, who represented Voces de la Frontera, said “this would not be an alarming case if these were normal times,” referring to recent ICE roundups of immigrants. A constitutional claim like the one in Oregon is possible, Earle said, if defendants caught up in the program can be identified. There is a concern, he said, that people will just get lost in the system. Earle said the inmates held under the federal program are accused of state and local offenses, not federal crimes. The federal government also does not compensate the county for the costs it incurs holding the inmates for ICE. In Oregon, Miranda-Olivares was arrested for violating a domestic violence restraining order and booked into the the Clackamas County Jail on March 14, 2012, according to the decision by U.S. Magistrate Judge Janice M. Stewart. The jail the next morning received the federal request to hold Miranda-Olivares. Miranda-Olivares was charged with two counts of contempt of court and a judge set bail at $5,000. Under normal circumstances, she could post $500 cash and be freed. In this case, though, there was that ICE detainer. Jail officials, over the next two weeks, told Miranda-Olivares’ sister repeatedly that Miranda-Olivares would not be released even if the bail was posted because of that document. Miranda-Olivares eventually pleaded guilty to one charge and was sentenced to 48 hours in jail, with credit for time served. She was held for an extra 19 hours, however, because of the ICE detainer. In her decision, Judge Stewart noted that complying with an ICE detainer request is voluntary, not mandatory. ICE, however, did not show probably cause to hold Miranda-Olivares, Stewart said. “It stated only that an investigation ‘has been initiated’ to determine whether she was subject to removal from the United States,” she wrote. “There is no genuine dispute of material fact that the County maintains a custom or practice in violation of the Fourth Amendment to detain individuals over whom the County no longer has legal authority based only on an ICE detainer which provides no probable cause for detention,” Stewart wrote. Gretchen Schuldt is biggest liar in Wiscosnin. Wisconsin conservative digest has constantly lied every time they post something. Should be “Wisconsin conservative fake news digest!! Here is what I believe is a reasonable approach to resolving the immigration issues that are dividing our nation and our local communities. Most of the following ideas have the potential to gain broad popular support. If enough voters contact Congress and the White House to support these these changes, they might finally take action. 1. Establish a process by which illegal immigrants who have been working (and sometimes paying taxes) and who have not committed any violent or serious crimes can obtain permanent legal status. Subsequently obtaining US citizenship and the right to vote may or may not be an option for these individuals. 2. Continue to deport serious criminals and consider deportation for certain others. Others to consider for deportation might include those who have not sought employment but who instead may have taken advantage of benefits such as welfare, food stamps, etc. in an abusive manner. I suspect few of the undocumented or “illegal” immigrants fall into that category – most come here to work and create a better life for themselves and their families. 3. Expand the legal immigration options by which larger numbers of workers can come here temporarily/seasonally or permanently with their families, as appropriate, without spending years on a waiting list. This will ensure that we continue to meet our labor needs in places where the economy depends on the availability of this labor, and allow these guest workers and immigrants to build a better life for themselves and their families legally. 4. Strengthen border security selectively where it is most needed. However, we should not spend $20 billion or more to build a wall covering every square inch of our southern border. I’m not sure what the right amount is to spend on border security or precisely what to spend it on, but we should depend on local authorities and experienced, knowledgeable border security professionals to determine how to do this wisely, and only where additional security is really needed and will make a difference. 5. Crack down hard on employers who continue to hire illegal workers after these changes are in place. 6. Work in efficient and meaningful ways to help our neighboring nations improve the living conditions for their own citizens.This will keep more of them home instead of seeking to illegally enter the US. Such a policy would be human and would be responsible, and would be in our own best interest. Think these ideas make sense? Write your member of Congress, and the White House.